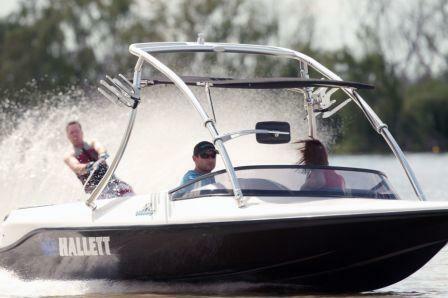 Material GRP Found in its natural terrain this 20' family ski/wake boat glides effortlessly through the water. With smooth handling, this boats natural environment is in the water, and will put even the novice driver at ease, regardless of whether you are fanging it, or taking a glide on calm velvety waters. The hull design is taken from the Hallett Stinger. The 'Venom' has Hallett's famous handling capability, with the dual centre fin providing better grip on the water as well as enhanced straight-line tracking and an amazing unique turning ability. The 'Venom' also has Hallett's unique transom design, which prevents other boat wakes from swamping your boats. With a storage locker at both the front and rear of this boat you certainly won't be lacking in room to keep your equipment, coming standard with choice of colours, and designs, adjustable drivers seat, tilt steering, carpeted lockers, bilge pump and swim deck. Perfect for all types of watersports from skiing to kneeboarding, to inflatables and wakeboarding or even just to cruise. This boat is sure to suit. This boat is sure to intoxicate.